Words normally associated with innovation are creativity, originality and imagination. However for businessman Frank McNamara, the words might be forgetfulness and embarrassment. 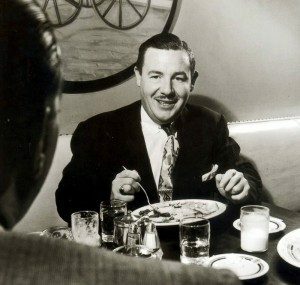 In the fall of 1949, businessman Frank Majors had taken some clients to have dinner at the Cabin Grill restaurant in New York City. The meal came to an end and McNamara asked for the bill but when he reached into his jacket he was embarrassed to discover that he had forgotten his wallet. Luckily for him, his wife was able to bail him out and he was saved from an evening of washing the dishes! As the embarrassment faded he resolved never to be caught out like that again and the germ of an idea came to him. He wondered why a businessman couldn’t be free to spend what he could afford rather than how much cash he had in his pocket at the time. He discussed his idea first with the restaurant owner and later with his lawyer and friend Ralph Schneider. Together they built the concept of a club of diners who would be able to sign for their suppers at selected restaurants and settle the bill at a later date. 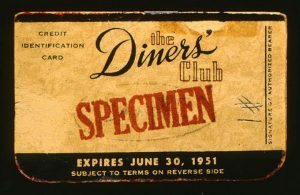 McNamara and Schneider formally founded Diners Club International on February 8, 1950 with $1.5 million initial capital. Membership of the club was $3 and McNamara quickly recruited 200 friends and acquaintances as well as signing up 27 restaurants. The pair decided they should celebrate the launch of their new venture and of course there was only really one way to do that. They returned to Major’s Cabin and when the bill arrived McNamara presented the owner with a small cardboard card, his Diners Club Card. It is an event which is now known as the “First Supper”. The Diners Club was an immediate hit. By year’s end, 20,000 people were members. In 1952, franchises were established in Canada, Cuba and France. In 1955, Western Airlines became the first air carrier to accept the card for payment. 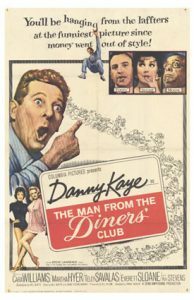 In 1963 Danny Kaye starred in the movie, “The Man From the Diners’Club” in which he played an employee at Diners Club who issues a credit card to a well-known mobster and has to retrieve it in order to keep his job. And the moral is that inspiration can come from all sorts of places and incidents. Are you looking for new ideas in the right places?